Chamber Music is undoubtedly one of the most intimate forms of instrumental music and the one that truly develops and refines the musical skills of a musician. The third term evening concert is specifically designed to showcase the genre of Chamber Music. 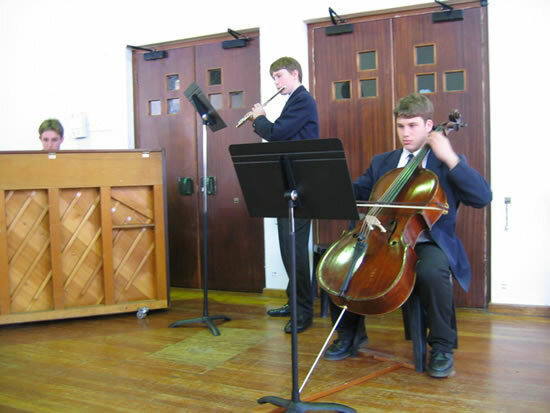 During this term boys of all instrumental backgrounds team up with each other to explore this genre of music making. The work is done on a self-study basis, with the music staff only acting on a consultative basis. This allows the groups to explore and develop their own musical decision processes. The repertoire performed in the past couple of years have included Haydn Piano Trios, Mozart Epistle Sonatas and Gabrieli Brass Quartets. At various stages during the year we also invite guest performers, often including some of our own instrumental teachers, to perform chamber music.